Nautilus 2018 Field Schedule Map. Image courtesy of the Ocean Exploration Trust. Download image (jpg, 76 KB). From June to November, scientists will use the Ocean Exploration Trust’s Exploration Vessel (E/V) Nautilus to document and survey unexplored regions from British Columbia, Canada, along the West Coast of the United States, and for the first time, west to the Hawaiian Islands. This marks the ship’s fourth year of exploration in the Eastern Pacific Ocean and will be one of its most extensive seasons to date. The NOAA Office of Ocean Exploration and Research has a long-standing partnership with the Ocean Exploration Trust, providing support for the complementary ocean exploration program of Nautilus, which operates under a similar paradigm as NOAA Ship Okeanos Explorer. By collaborating on mission plans, NOAA and the Ocean Exploration Trust are helping increase understanding of our largely unknown ocean, illustrate the value and importance of ocean exploration, and develop the next generation of ocean explorers. Throughout the Nautilus field season, you can follow discoveries and interact with scientists live via the nautiluslive.org website. Also, stay tuned to Facebook , Instagram at NautilusLive , and Twitter as @EVNautilus for updates. Beginning in San Pedro and ending in San Francisco, California, this short mapping expedition focused on completing gaps from previous mapping in the Channel Islands National Marine Sanctuary and adjacent waters. Three areas were identified for mapping with the E/V Nautilus multibeam echosounder and sub-bottom profiler in order to collect general bathymetric data, characterize the seafloor, and possibly detect gas seeps. Learn more about the expedition here . An octopus surrounded by brittle stars. Image courtesy of the Ocean Exploration Trust. Download larger version (jpg, 445 KB). 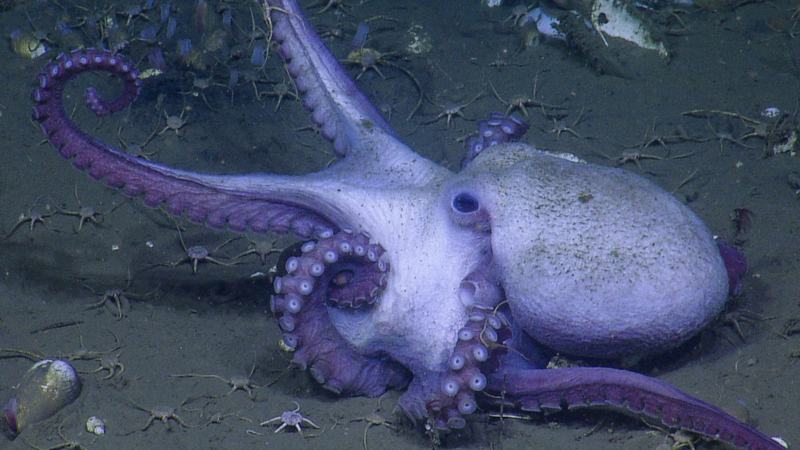 During this expedition, scientists used remotely operated vehicles (ROVs) Hercules and Argus, as well as E/V Nautilus’ sonar systems to explore for methane seeps and hydrate sites and to characterize their associated ecosystems along the U. S. Cascadia Margin. The systematic mapping and characterizing of methane seep sites along the Cascadia Margin can help us to better understand the impacts of seeps on bottom and mid-water ecosystems and to constrain the current flux of methane into the ocean. Establishing such a baseline is timely because ocean warming and geological events, such as earthquakes or submarine landslides, could result in important environmental impacts due to sudden methane release. Dr. Marc Fries conducted an initial visual analysis of sediment samples collected, and his preliminary findings include two small fragments of fusion crust–meteorite exterior that melted and flowed like glaze on pottery as it entered the atmosphere. 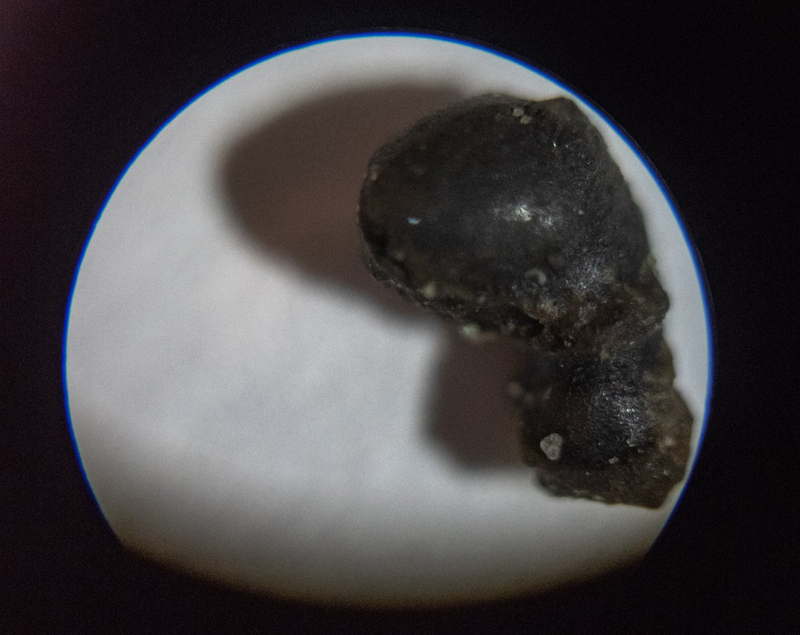 This image of one of those fragments was captured through a DIY microscopy rig made of a DSLR camera and a Magiscope field microscope. Image courtesy of Susan Poulton, Ocean Exploration Trust. Download larger version (jpg, 446 KB). During this short expedition, E/V Nautilus transited from Astoria, Oregon, to Sidney, British Columbia, using the ship’s multibeam echosounder and sub-bottom profiler to fill in gaps in high-resolution mapping in the Olympic Coast National Marine Sanctuary. The purpose of this surveying effort was for general bathymetric data collection and seafloor characterization (backscatter). While transiting north, Nautilus collected samples likely from a rare, large meteorite fall that was observed off the coast of Washington in March 2018. 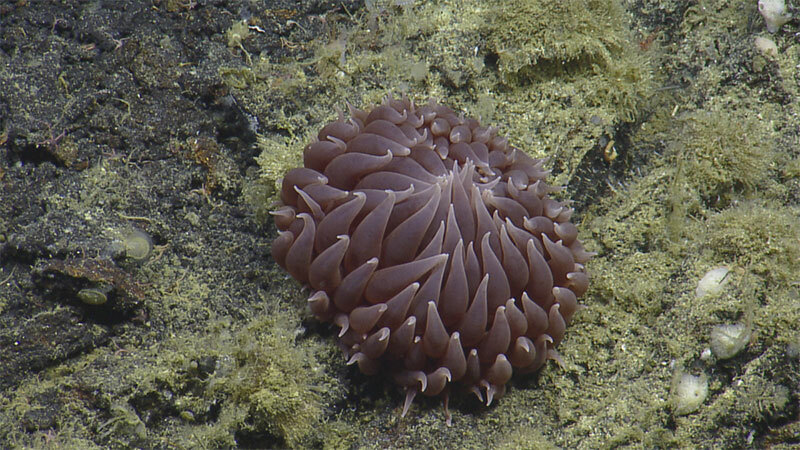 A pom pom anemone (genus Liponema) was spotted on the second Dellwood seamount dive of the expedition. Image courtesy of the Ocean Exploration Trust, Northeast Pacific Seamount Expedition Partners. Download larger version (jpg, 445 KB). During this expedition, working in partnership with Fisheries and Oceans Canada, Ocean Networks Canada, and Oceana Canada, E/V Nautilus will conduct mapping and ROV operations to survey three offshore Pacific seamounts. The expedition’s broad-scale survey activities will produce high-resolution bathymetry maps of the seamounts and provide information on the depth and topographic distribution of Vulnerable Marine Ecosystems in the region. The expedition will provide the first baseline data and observations of environmental variability and species within this region to inform conservation and management objectives. By moving through the food web from the plankton they eat upward to several important secondary consumers that prey upon them, Clupea pallasii is considered a keystone species. 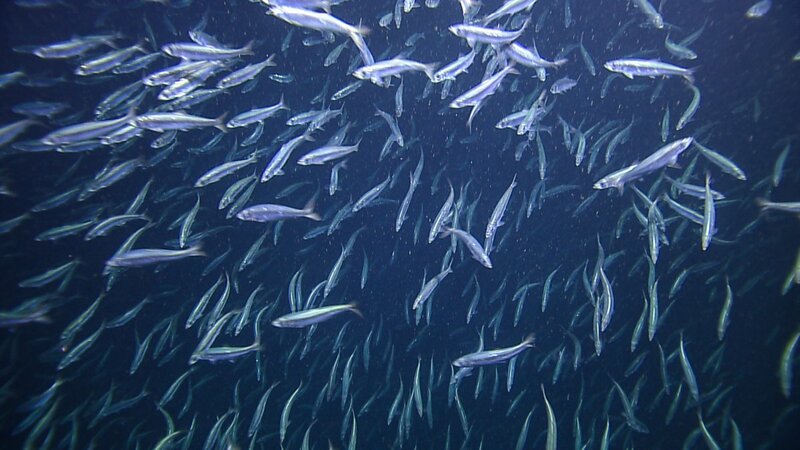 Herring form large schools and range from the surface down to 400 meters. Once each year, the adults migrate to shoreline estuaries to spawn. 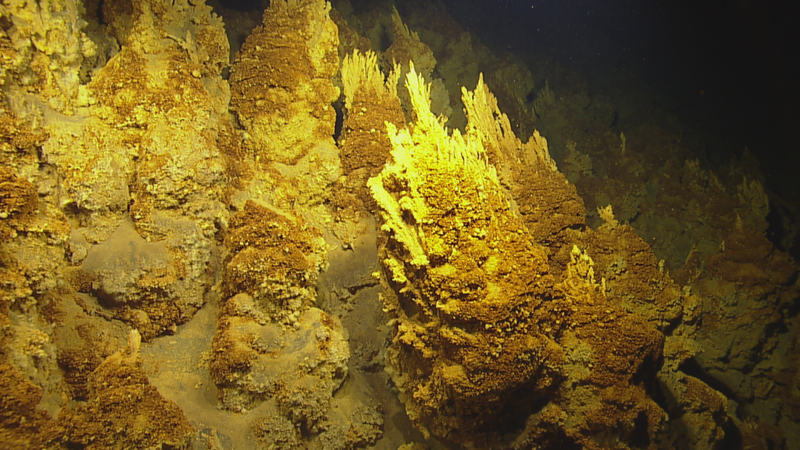 This school was encountered at ~300 meters as ROV Hercules descended at Barkley Canyon. Image courtesy of the Ocean Exploration Trust, Ocean Networks Canada. Download larger version (jpg, 447 KB). For the fourth season, E/V Nautilus explored Canadian waters in partnership with Ocean Networks Canada. The main objective of this expedition was to provide maintenance and support of Ocean Networks Canada’s NEPTUNE observatory located off the west coast of Canada. In addition to deploying, recovering, and providing maintenance for various NEPTUNE observatory sensors and instruments, E/V Nautilus also conducted seafloor mapping surveys, ROV surveys, and sampling. During this expedition, E/V Nautilus will transit from Sidney, British Columbia, to Hilo, Hawaii, conducting mapping operations along the way. The transit route will commence with passage to cross the Mendocino Fracture zone, to complete a line of mapping in support of the U.S. Extended Continental Shelf Project. The continued transit route will fill additional gaps in seabed mapping coverage across the Pacific, plus involve targeted mapping of a number of seamounts in the vicinity of the Murray Fracture zone. The iron-oxidizing bacteria at Lōʻihi Seamount have the remarkable ability to create intricate structures through biomineralization, such as the finger-like stalks pictured above. Image courtesy of the Ocean Exploration Trust. Download larger version (jpg, 869 KB). This expedition marks the beginning of the multi-year SUBSEA (Systematic Underwater Biogeochemical Science and Exploration Analog) Research Program, a partnership between NASA, NOAA, and various academic centers to blend ocean exploration with ocean worlds research and address knowledge gaps related to the habitability potential of other planets in our Solar System. The SUBSEA team will begin their research cruise at the isolated submarine volcano of the Lō`ihi Seamount off Hawai`i, which is part of a volcanic system detached from Earth’s plate tectonic boundaries, with geologic history and current hydrothermal venting that makes it a relevant analog environment to other ocean worlds, or planets with water. At the seamount, the team will conduct telerobotic science to observe, survey, gather instrument data, and collect samples from fluid venting locations in the deep ocean. They will also test approaches and protocols developed to apply ocean exploration techniques to space exploration, which will significantly contribute to the state of knowledge of methods for productively and safely conducting long-duration telerobotic missions with visual observation, instrument data, and sample collection under time delay. 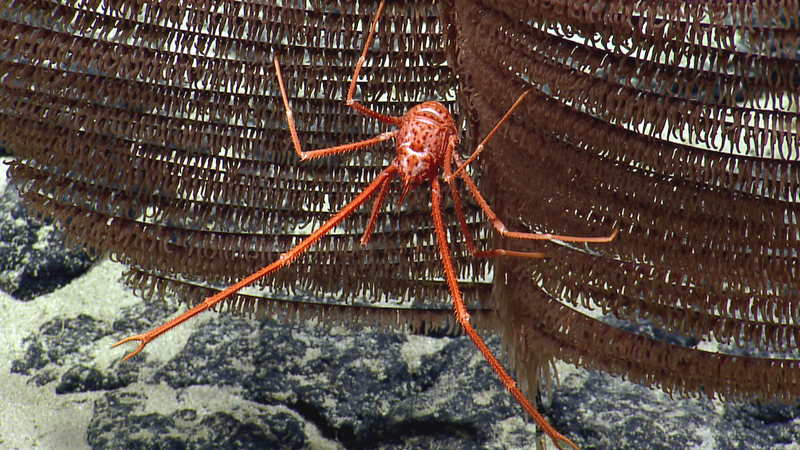 While corals and sponges dominate the initial biodiversity studies of seamounts, various species of a crustacean called a squat lobster, like this Uroptychus sp. were seen on many dives. Image courtesy of the Ocean Exploration Trust. Download larger version (jpg, 1.0 MB). During this expedition, scientists will conduct mapping operations and subsequent ROV dives on enigmatic seamounts located in a poorly explored area of the Papahānaumokuākea Marine National Monument. The objectives are to determine how and when these seamounts formed and to document the biological communities that presently live on them. Mapping data and rocks collected during the dives will be used to test the hypothesis that these seamounts were formed by the poorly understood process of arch volcanism. Data collected during the cruise will improve understanding of these relatively unknown ecosystems, thus informing resource management efforts related to protecting deepwater habitats, commercial mining, and sustainable fisheries in the Central Pacific. 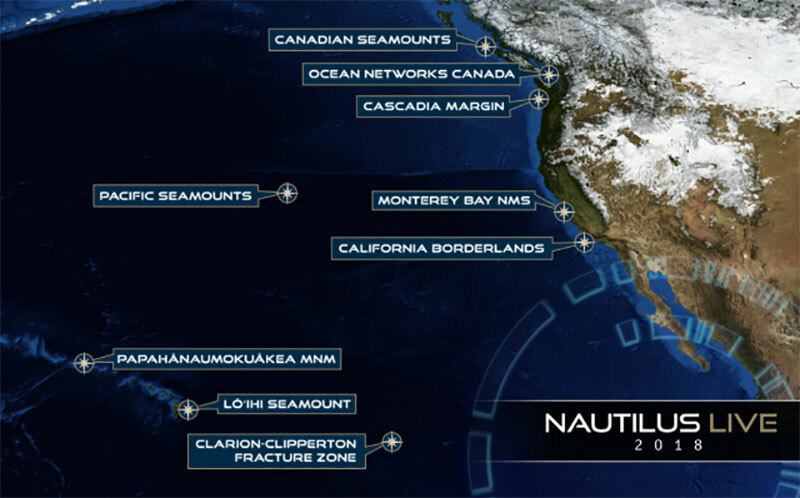 During this mapping expedition, E/V Nautilus will transit from Honolulu, Hawaii, to San Francisco, California. The initial phase of the transit has been planned to transit southeast from Honolulu to map a section in the Clarion Clipperton Fracture Zone that is adjacent to areas designated for seabed mining under the International Seabed Authority. The remainder of the transit route is planned to utilize E/V Nautilus’ multibeam echosounder and sub-bottom profiler to fill in gaps in seafloor mapping coverage across the Pacific. The main objective of this expedition is to characterize an unexplored, deepwater region of basaltic rocky reef that resides southeast of Davidson Seamount, within the borders of Monterey Bay National Marine Sanctuary. Scientists will use the Hercules ROV to complete initial surveys of the unexplored rocky habitat to characterize the area and document distribution and abundance of deepwater corals, sponges, and fishes; collect biological specimens to accurately describe and study species observed and to analyze fish tissue for poly-chlorinated biphenyls (PCBs); analyze water and sediment samples for PCBs and pesticides; and collect environmental data to aid in our understanding of the physical conditions of deepwater habitat. The primary focus of this expedition is the identification and characterization of submerged shorelines associated with offshore banks in the southern California region. This is a follow-on to the effort by E/V Nautilus over the last four years to acquire high-resolution mapping data of submerged shorelines and characterize primarily with remotely operated vehicles. The 2018 effort will focus on offshore banks, since those do not receive terrigenous sediment input, which obscures shoreline features, such as caves, from view. Results of the study will aid in understanding the complex sea level change and tectonic history of the Northern Channel Islands. Additionally, collected data will help inform resource protection issues including incident response and restoration, protected resource and fisheries management, navigational safety, and conservation. The partnership between the NOAA Office of Ocean Exploration and Research and the Ocean Exploration Trust has been an evolving one, tracing its roots back to 2000. NOAA Ship Okeanos Explorer was developed alongside E/V Nautilus, allowing the sharing of telepresence technology to bring the wonder of ocean exploration from ship to shore. In addition to providing funding support for the Nautilus mission, the NOAA Office of Ocean Exploration and Research continues to work with the Ocean Exploration Trust to advance technology and reduce uncertainties in critical parts of our largely unexplored deep ocean.